"Sweet raisins, sour olives and piquant capers conspire to make this a memorable main dish." Soak raisins in lukewarm water for 30 minutes. Drain and set aside. Preheat oven to 400 degrees F (200 degrees C). Heat olive oil in a large saucepan or skillet over high heat. Saute onion and garlic until soft. 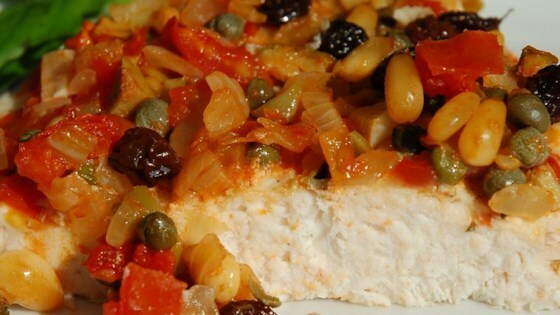 Stir in raisins, tomatoes, olives, pine nuts and capers. Cover pan, reduce heat to medium and cook for 15 minutes. Season the steaks with salt and pepper. Place in a lightly oiled baking dish and cover with the cooked sauce. Bake in preheated oven for 15 to 20 minutes, until steaks are firm. It was good. Mine still came out a little dry and I felt the sauce/mixture overpowered the taste of the fish. Some people don't like the taste of fish though, so maybe it works for them. This swordfish recipe is EXCELLENT!!! Even my picky hubby ate it. It has the right flavor, and the raisins gave it a nice blend!